Welcome toEnviro Tech Industrial Products. Offering you a Complete Choice of Products Which Include Adjustable Pressure Switch, Bourdon Tube Pressure Switches, Brass Digital Pressure Gauge, Diaphragm Operated Pressure Switch, Digital Calibration Pressure Gage and Digital Indicating Transmitter. Switch Type SPDT snap action. Electrical Rating 5 A 250 VAC, 3 A 28 VDC. Electrical Connection 3-wire, 20 AWG insulated with PVC, 12" (30 cm) length. Process Connection 1/8" male NPT. Weight 3 oz (85 g). 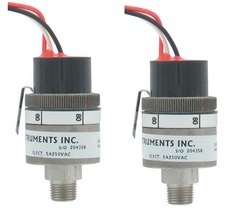 Miniature SERIES APS/AVS Adjustable Switches offer reliable switching for pressure/vacuum alarm, shutdown or control. The units are readily adjustable throughout their range using the locking adjusting ring and indicating pointer. The body is constructed of stainless steel for durability in harsh environments. Switches include 12" (30 cm) wire leads sealed with epoxy for additional protection. Looking for DWYER PRESSURE GAUGE WHOLESALER IN INDIA ?